Docker changed not only how applications are deployed, it also changed the workflow for log management. Instead of writing logs to files, containers write logs to the console (stdout/stderr) and Docker Logging Drivers forward logs to their destination. A check against Docker Github issues quickly shows that users have various problems when dealing with Docker logs. Managing logs with Docker seems to be tricky and needs a deeper knowledge of Docker Logging Driver implementations and alternatives to overcome issues that people report. So what are the top 10 Docker logging gotchas, every Docker user should know? First, let’s start with an overview of Docker Logging Drivers and options to ship logs to centralized Log Management solutions such as Elastic Stack (former ELK Stack) or Sematext Cloud. In the early days of Docker, container logs were only available via Docker remote API, i.e. via “docker logs” command and a few advanced log shippers. Later on, Docker introduced logging drivers as plugins, to open Docker for integrations with various log management tools. These logging drivers are implemented as binary plugins in the docker daemon. Recently, the plugin architecture got extended to run logging drivers as external processes, which could register as plugins and retrieve logs via Unix socket. Currently, logging drivers shipped with docker binaries are binary plugins, but this might change in the near future. To ship logs to one of the backends you might need to select a logging driver or logging tool that supports your Log Management solution of choice. If your tool needs Syslog input, you might choose the Syslog driver. Have you started using Kubernetes? We’ve prepared a Kubernetes Cheat Sheet which puts all key Kubernetes commands (think kubectl) at your fingertips. Organized in logical groups from resource management (e.g. creating or listing pods, services, daemons), viewing and finding resources, to monitoring and logging. Download yours. Let’s look into Top 10 Docker logging gotchas every Docker user should know. The default Logging driver “json-file” writes logs to the local disk, and the json-file driver is the only one that works in parallel to “docker logs” command. As soon one uses alternative logging drivers, such as Syslog, Gelf or Splunk, the Docker logs API calls start failing, and the “docker logs” command shows an error reporting the limitations instead of displaying the logs on the console. Not only does the docker log command fail, but many other tools using the Docker API for logs, such as Docker user interfaces like Portainer or log collection containers like Logspout are not able to show the container logs in this situation. This means a temporary network problem or high network latency could block the deployment of containers. In addition, a restart of the Syslog server could tear down all containers logging via TCP/TS to a central Syslog server, which is definitely the situation to avoid. Similar to the issue #2 above, causing a loss of logs is the missing ability of Docker logging drivers to buffer logs on disk when they can’t be delivered to remote destinations. When we think about logs, most people think of simple single-line logs, say like Nginx or Apache logs. However, logs can also span multiple lines. For example, exception traces typically span multiple lines, so to help Logstash users we’ve shared how to handle stack traces with Logstash. Things are no better in the world of containers, where things get even more complicated because logs from all apps running in containers get emitted to the same output – stdout. No wonder seeing issue #22920 closed with “Closed. Don’t care.” disappointed so many people. Luckily, there are tools like Sematext Docker Agent that can parse multi-line logs out of the box, as well as apply custom multi-line patterns. While the json-files driver seems robust, other log drivers could unfortunately still cause trouble with Docker Swarm mode. Another scenario where a logging driver causes trouble when the remote destination is not reachable – in this particular case the logging drivers throws exceptions that cause Docker daemon to crash. If the Splunk server returns a 504 on container start, the container is actually started, but docker reports the container as failed to start. Once in this state, the container no longer appears under docker ps, and the container process cannot be stopped with docker kill. The only way to stop the process is to manually kill it. It turns out that this issue is caused by journald rate limits, which needs to be increased as Docker creates logs for all running applications and journald might skip some logs due to its rate limitation settings. So be aware of your journald settings when you connect Docker to it. The Gelf logging driver is missing a TCP or TLS option and supports only UDP, which could be risky to lose log messages when UDP packets get dropped. Some issues report a problem of DNS resolution/caching with GELF drivers so your logs might be sent to “Nirvana” when your Graylog server IP changes – and this could happen quickly using container deployments. It would be nice to have logs stored locally on the server and the possibility to ship them to remote servers. Currently, Docker does not support multiple log drivers, so users are forced to pick a single log driver. Not an easy decision knowing various issues listed in this post. That’s it! 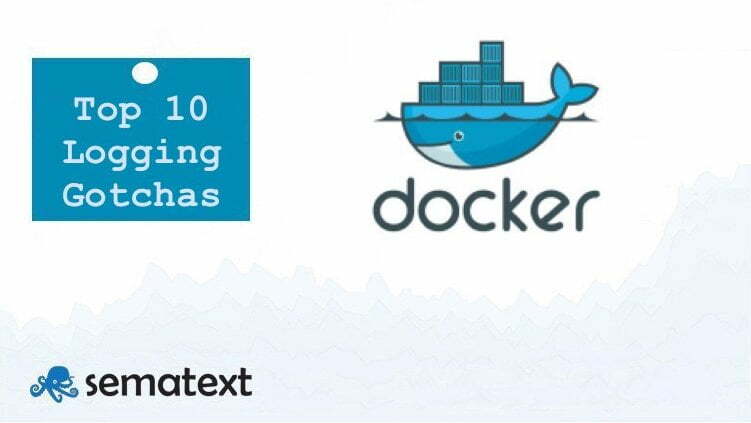 My Top 10 Docker Logging Gotchas! You should think about not only collecting logs, but also host and container metrics, and events. To help with that, we’ve prepared a reference architecture document about all key Docker metrics to watch. Following that, you will learn how to set up monitoring and logging for a Docker Enterprise Cluster. This e-book shows how to collect metrics, events, and logs. Specifically, you’ll learn how to use Sematext Docker Agent for automatic collection and processing of Docker Metrics, Events and Logs for all cluster nodes and all auto-discovered containers.